Abdel-Fattah al-Sisi’s Sinai campaign: Egypt’s military is targeting civilians and militants in a brutal crackdown. 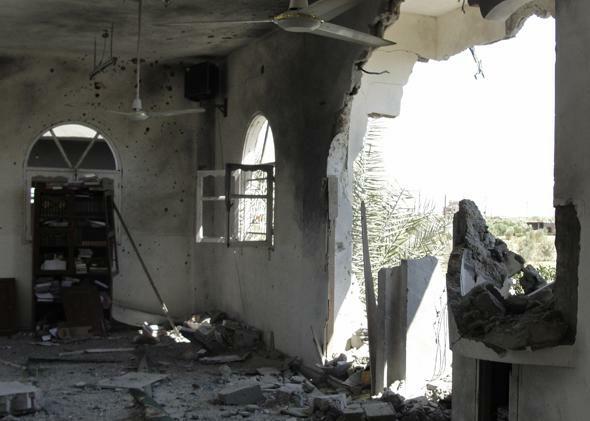 The military’s brutal North Sinai campaign is targeting civilians and militants alike. The black, charcoaled remains of a cow’s body lies in a field behind a shelled-out mansion. 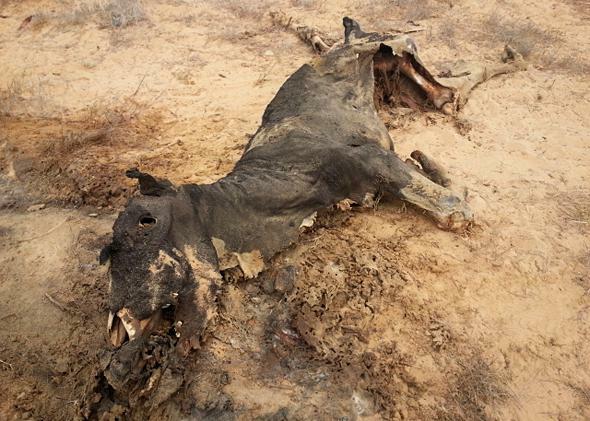 NORTH SINAI, Egypt—The black, charcoaled remains of a cow’s dead body lies in a sandy field behind a shelled-out mansion. Washed-out blood stains the walls of an unpainted grey room where sons say their 80-year-old mother was killed by army tank fire. Bullet holes pockmark the house. A 9-year-old girl’s cheek is marked by a pink incision where a rock hit her face as her home was strafed by helicopter fire. A child’s sandal and burned Quran were among the rubble of a mosque that locals say was destroyed by ground and air military troops. I watched as an IED exploded under an armored personnel carrier as it turned a corner. Black smoke filled the air, and an olive tree was uprooted. Later, two soldiers were reported injured. These are some of the casualties of the Egyptian army’s war on “terrorists” in the villages and towns that dot the north of the Sinai Peninsula close to the borders of Gaza and Israel. In September, the military stepped up a two-month campaign to rid the area of militants by “taking action against terrorists, instead of merely reacting to terrorist attacks,” said army spokesman Ahmed Ali. Egyptian security forces have been coming under increased attack after army chief Gen. Abdel-Fattah al-Sisi ousted President Mohamed Morsi in early July. Al-Qaida-inspired militants in Sinai have killed more than 100 members of the security forces since then, according to the Egyptian military. 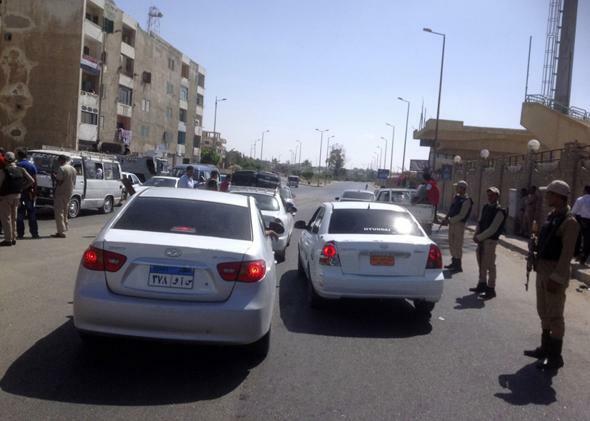 State-run newspapers have reported that Sinai’s tribes, sheikhs, and locals have welcomed the military’s widening campaign. But there is little evidence of it on the ground. People in attacked villages and towns, including those sympathetic to the military, complain that it is conducting its war indiscriminately, not differentiating between civilians and militants. Soliders stand guard around the area where rocket-propelled grenades hit a bus in El-Arish on July 15, 2013. It’s a bold thing to say, especially to a journalist. Critics of the army’s campaign are being severely punished, and the military restricts journalists’ access to the areas where it is conducting its operations. I am one of the few Western journalists to have entered North Sinai since the September campaign began. Sheikh Ibrahim El-Menaei, head of a coalition of Sinai’s tribes, says that at least 52 people have been killed since the military began its campaign in July; of those slain, 16 were women and children. He is a vocal critic of Egypt’s policies toward the tribes. The next day, the army bombed Sheikh Ibrahim’s meeting place and two homes, he said by phone. Photographs, verified by his son, show houses turned to rubble. The Islamist militant group Ansar Bayt al-Maqdis, which has claimed responsibility for numerous attacks on Egyptian security targets and Israel over the past two years, including a failed suicide bombing on the Interior Minister in Cairo last month, has also reported the deaths of innocents. The Egyptian military denies responsibility for these deaths. In early September, Ahmed Abu Draa, a Sinai-based journalist, was jailed for reporting on attacks on women, children, and a mosque. The army says he published false news, and that his reporting is part of an “information war.” He has since been released with a six-month suspended sentence for entering a military zone without authorization. The military has never “demolished a mosque or attacked children and women in Sinai as claimed,” the spokesman said. Again, the picture on the ground indicates otherwise. I interviewed 30 people over three nights and four days in September in the two border villages of Muqataa and Mehdeya, and in El-Arish, north Sinai’s largest town. These people spoke of indiscriminate killing, shelling, looting, and the destruction of homes and a mosque. 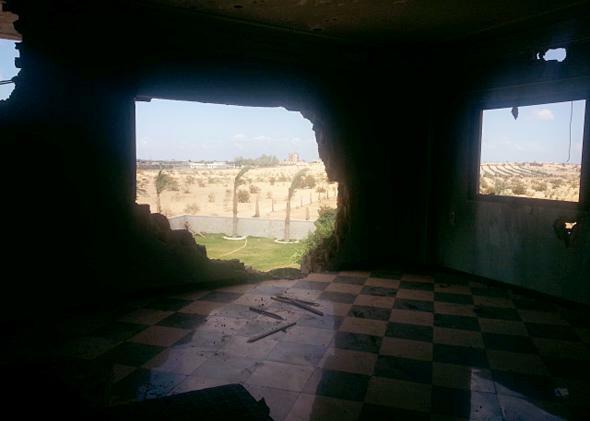 The Egyptian army is also stepping up its efforts to shut down the illicit trade tunnels between Sinai and Gaza. Those affected say they would welcome this, if an alternative source of income were being offered. But it is not. As long as that continues, people are just going to get angrier and more desperate, they say. Debris is seen in a mosque damaged from assaults on militant targets by the Egyptian Army, in a village near the city of El-Arish in Egypt’s Sinai Peninsula on Sept. 10, 2013. “If there’s no political solution, you’ll start to see suicides on the border,” said Khaled, whose family’s homes were bombed by the army in Rafah town, 20 meters away from the nearest tunnel to Gaza. What’s left is a pile of grey stone rubble. “The area will explode if there’s no development,” he said, asking that his surname not be used for fear of further reprisals by security forces. The prevailing mood is one of fear. People are too scared to work with the army, because they risk assassination by militant groups, and they are too afraid to take up arms against a well-armored military, many said. In an Oct. 4 statement, the al-Salafiyya al-Jihadiyya, a jihadist group in Sinai, threatened to kill anyone found aiding Egyptian security forces. “The treacherous agent will only get the sword,” it said, according to the Long War Journal, a Washington, D.C.-based news and analysis website on terrorism. While children are filling classroom halls in Cairo, nearly 150 miles away, mothers in North Sinai say they won’t send their children to school as long as the campaign continues. The start of the school term has already been delayed to Oct. 19, because of poor security conditions. “I’m too scared to get school clothes and stationery for my children. I’m scared for the driver and me. There’s no guarantee we won’t get hit,” said Fawziya, a Bedouin mother of four, who asked that her surname not be used. One of the most harrowing scenes she described was when army helicopters flew low over a man riding on a motorbike in the village of Mehdeya and shot him dead. As we spoke, two helicopters hovered in the sky over Muqataa, the neighboring village. Black smoke rose in the air. Mehdeya’s residents could only speculate what was going on because it was impossible to get through to anyone in that village. The phone and Internet networks had been shutdown. The inside of a Mehdeya businessman’s home. Mostafa Hameed, a bearded Salafi imam and investigator at Arish’s largest informal Islamic court, hasn’t slept at his home for the last month. His colleagues, two prominent Salafi judges, were arrested just days earlier. They are accused of inciting violence against security forces. Shady El-Meneai, a member of Ansar Bayt al-Maqdis, one of a handful of hardline groups in North Sinai, hasn’t been seen in more than 20 days, his brother told me. The military has shelled his family’s home on several occasions. Sinai’s militancy has grown partly out of years of state neglect of the northern province’s development needs and heavy-handed security crackdowns, analysts say. People here complain of arrests with no charges and torture in prison, as well as policies that have alienated Bedouin tribes from the rest of the Egyptian population. Over the years, political grievances have come to be expressed in increasingly ideological terms. Two Egyptian journalists, mistakenly believed to work for the Qatari-owned Al-Jazeera channel, were beaten and briefly arrested by the police and military at their hotel in Arish on the night I arrived there. Egyptian authorities accuse Al-Jazeera of being biased toward Morsi and the Muslim Brotherhood. Sheikh Ibrahim, of the Sinai tribes coalition, believes his family’s homes were targeted because he spoke critically of the military on Al-Jazeera. Thirty-year-old Naeem, from the village of Muqataa, also appears to be a victim of these rising tensions. (Again, Naeem and his family asked that their surnames not be used.) Naeem and his mother, Hessa, said six army officers entered and ransacked their home on Sept. 22. They took his laptops, legal titles, television, two gas cylinders, his wife’s makeup, gold, and cash. They helped themselves to water in the fridge, and put pillowcases on the heads of Naeem’s 6-month-old twins when they cried. Then they burned his house to the ground. His home and his car repair shop were two of the buildings I saw blackening the sky with smoke the day before. The walls of his family’s home were still smoldering. Others villagers reported similar behavior. * Correction, Oct. 8, 2013: This article originally misstated that Mohamed Ali ruled Egypt until 1952. He was the viceroy of Egypt between 1805 and 1848. His dynasty ruled the country until 1952.